Free delivery for scan forum members! UPDATE 27/12 - It seems like not all order's will be fulfilled due to the typical excuse of not enough stock!! Apparently over 1000 units not fulfilled and will not know anymore information until they speak with the supplier on Monday 30th. All too common!!!! We've had a lot more orders than expected. One of the issues is that many people have ordered them in 5's, 10's, 20's etc, which have thrown out the figures.. we're now going through a process of allocation and will allocate one per customer so that most of you get one. We are expecting more stock and the end of next week also. Everyone will be updated by mail very soon, so please be patient. We've also come back to more than expected number of general orders but are clearing through them as fast as we possibly can. Our warehouse team will be in over the weekend also to reduce the backlog. makes the moto g look like a terrible deal, and thats saying something! are these new or what? Can't find their definition of open box on the scan site - anyone got any idea? how do you get free del? Awesome deal - ordered & thanks! What does 'Open Box' mean? I'm assuming it's something like returned devices? Also what does 'MAC Compatible: X' mean in the Specifications? Ordered! Returning a Moto G I ordered! No it's not 4G compatible I'm afraid. The Nexus 5 is if you want to check that out. This is more or less better than the Moto G in every single department apart from possibly battery life. Anderson Aragos Nexus experience CM11 ROM 2.4 is just fantastic on this phone. Im running using ART instead of Dalvik and Android has never been as good. The reason I'd get this phone over the moto g is the custom ROM support, thrashes the moto g in that respect. Not sure about scan but at misco - open box means a customer return. 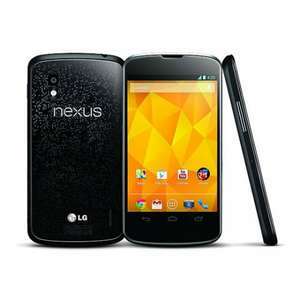 Got my nexus 4 three months ago and can thoroughly recommend it. After a Samsung S3, the screen colours seem a bit pale in comparison but I soon got used to it. The camera is ok but not up with best but everything else is top notch. Got the official KitKat 4.4 update weeks ago. I now prefer pure android to touchwiz and all that stuff that i never used anyway. System flies along and is always responsive. Use it with a screen protector and a ringke fusion case - well worth the expense. Hot deal. NO MEMORY CARD SLOT!! mind. for me this was key thing. otherwise great value for money.